Songkhla (Thai: สงขลา, [sǒŋ.kʰlǎː]; Malay: Singgora) is one of the southern provinces (changwat) of Thailand. Neighboring provinces are (from east clockwise) Satun, Phatthalung, Nakhon Si Thammarat, Pattani, and Yala. To the south it borders Kedah and Perlis of Malaysia. 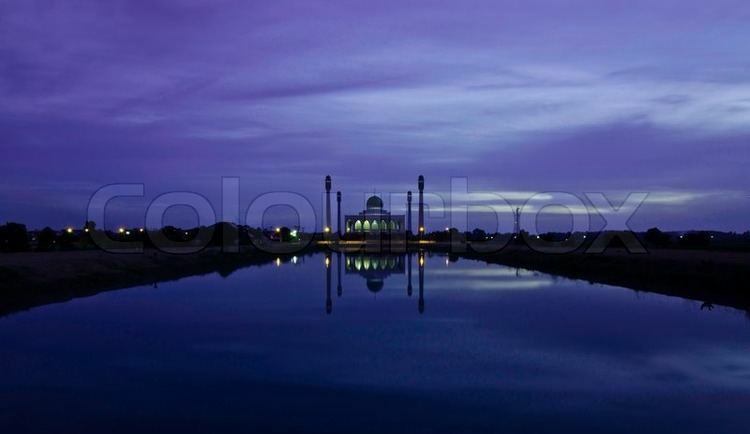 The province is on the Malay Peninsula, on the coast of the Gulf of Thailand. The highest elevation is Khao Mai Kaeo at 821 meters. In the north of the province is Songkhla Lake, the largest natural lake in Thailand. This shallow lake covers an area of 1,040 km², and has a south-north extent of 78 kilometers. At its mouth on the Gulf of Thailand, near the city of Songkhla, the water becomes brackish. A small population of Irrawaddy Dolphins live in the lake, but are in danger of extinction due to accidental capture by the nets of the local fishing industry. Songkhla Province hosts two national parks. San Kala Khiri covers 214 km² of mountain highlands on the Thai-Malay border. Khao Nam Khang, is also in the boundary mountains. Chinese Communist guerrillas inhabited this region until the 1980s. 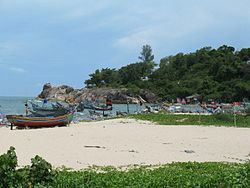 Within the boundaries of the city of Songkhla is Cape Samila Beach, the most popular beach in the province. The famous mermaid statue can be found here. The two islands Ko Nu and Ko Maew (Mouse and Cat Islands), not far from the beach, are also popular landmarks, and a preferred fishing ground. According to a local folk tale, a cat, mouse and dog were traveling on a Chinese ship, when they attempted to steal a crystal from a merchant. While trying to swimming ashore, both the cat and the mouse drowned and became the two islands; the dog reached the beach, then died and become the hill Khao Tang Kuan. The crystal turned into the white sandy beach. The name Songkhla is actually the Thai corruption of Singgora (Jawi: سيڠڬورا); its original name means "the city of lions" in Malay (not to be confused with Singapura). This refers to a lion-shaped mountain near the city of Songkhla. Songkhla was the seat of an old Malay Kingdom with heavy Srivijayan influence. In ancient times (200–1400 CE), Songkhla formed the northern extremity of the Malay Kingdom of Langkasuka. The city-state then succeeded as the Sultanate of Singgora, it later became a tributary of Nakhon Si Thammarat, suffering damage during several attempts to gain independence. Archaeological excavations on the isthmus between Lake Songkhla and the sea reveal that in the 10th through the 14th century this was a major urbanized area, and a center of international maritime trade, in particular with Quanzhou in China. 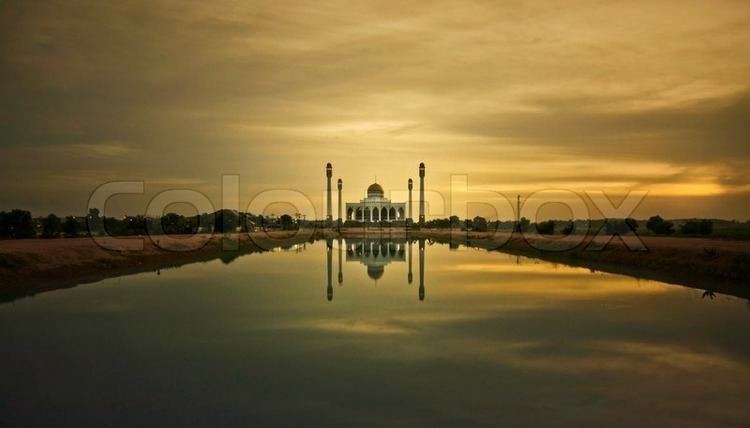 The long Sanskrit name of the state that existed there has been lost; its short Sanskrit name was Singhapura ("Lion City") (not to be confused with Singapura), a city state. The short vernacular name was Satingpra, coming from the Mon-Khmer sting/steng/stang (meaning "river") and the Sanskrit pura ("city"). The ruins of the important port city of Satingpra are just few kilometres north of Songkhla city. Since the 18th century, Songkla has been firmly under Thai suzerainty. In 1909, Songkhla was formally annexed by Siam as part of Anglo-Siamese Treaty of 1909, negotiated with the British Empire, in which Siam gave up its claim to Kelantan in return for Britain recognizing Siam's right to the provinces north of that. In the 18th century many Chinese immigrants, especially from Guangdong and Fujian, came to the province. Quickly rising to economic wealth, one of them won the bidding for the major tax farm of the province in 1769, establishing the Na Songkhla (from Songkhla) family as the most wealthy and influential. In 1777 the family also gained political power, when the old governor was dismissed and Luang Inthakhiri (Yiang, Chinese name Wu Rang (呉譲)) became the new governor. In 1786 the old governor started an uprising, which was put down after four months. The position was thereafter inherited in the family and was held by eight of his descendants until 1901, when Phraya Wichiankhiri (Chom) was honorably retired as part of the administrative reforms of Prince Damrong Rajanubhab. The family's former home was converted into the Songkhla National Museum in 1953. Songkhla was the scene of heavy fighting when the Imperial Japanese Army invaded Thailand on 8 December 1941 and parts of the city were destroyed. Songkhla was not initially affected by the recent outbreak of Pattani Separatism, which began in 2004. However, bombs planted in 2005 and 2007 created fear the insurgency might spread into Songkhla Province. The districts Chana and Thepha bordering Pattani have been under martial law since 2005. Buddhists make up about three-quarters of the population, most of whom are of native Thai or Thai Chinese descent. About a quarter of the population are Muslim, most of them belong to a Thai-speaking Muslim group, called Sam-Sam. People claiming to be of Malay ethnicity make up a minority among the Muslim populace. The Songkhla Malays are very similar in ethnicity and culture to the Malays of Kelantan, Malaysia. They speak the Patani Malay language, which differs from Bahasa Malay in vocabulary and pronunciation. Phetkasem Road, running all the way from Bangkok, ends at the border crossing to Malaysia in Sadao. Asian highway 2 and 18 also run through the province. Of note is the Tinsulanond Bridge, which crosses Songkhla Lake to connect the narrow land east of the lake at the coast with the main southern part of the province. With a length of 2.6 km it is the longest concrete bridge in Thailand. Built in 1986, the bridge consists of two parts. The southern 1,140 m connects Mueang district with the island Ko Yo, and the northern part of 1,800 m to Ban Khao Khiao. The southern railway runs through the province, and continues on into Malaysia, with Hat Yai being the main and southernmost station. In the past, a railway line connected the town of Songkhla with Hat Yai, but it was closed in 1978 and is now partly dismantled and partly overgrown. Kanchanawanit Road, which runs from Songkhla town, though Hat Yai, and all the way to the Malaysian border at Sadao District, is considered the unofficial dividing line separating the Thai south from its deep south, Muslim-majority region. 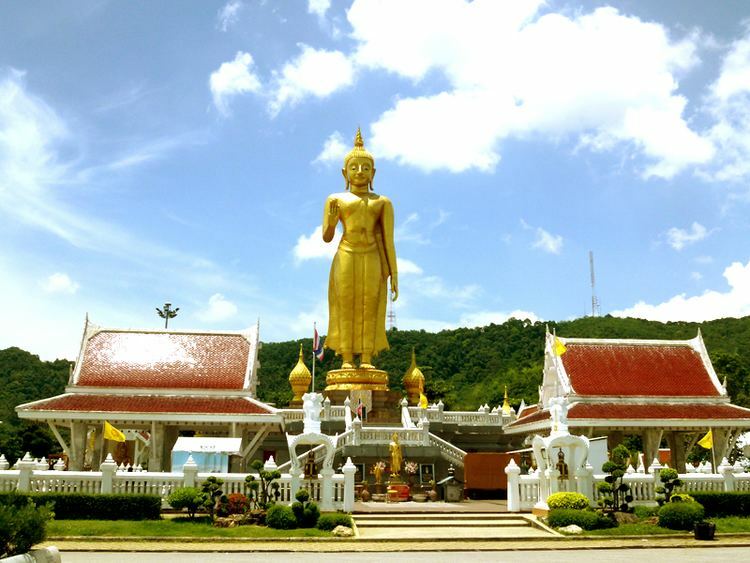 The most important Buddhist temple of the province is Wat Matchimawat (also named Wat Klang), on Saiburi road in the city of Songkhla itself. On the island Ko Yo within Songkhla lake, since being easily accessible via the Tinsulanond Bridge, the residents have started to sell the hand-woven fabric named Phathor Ko Yo. Also famous for the island is the local jackfruit variant named Jampada. Held in the first night of October, the Chak Phra tradition is a Buddhist festival specific to the south of Thailand. 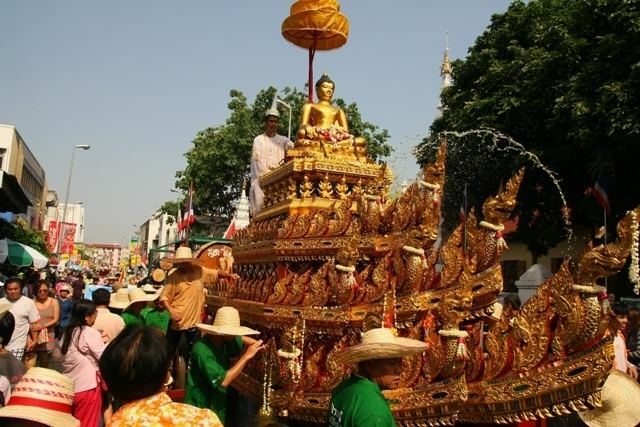 It is celebrated with Buddha boat processions or sports events like a run up Khao Tang Kuan hill. In September or October at the Chinese Lunar festival the Thai-Chinese present their offerings to the moon or Queen of the heavens in gratitude for past and future fortunes. The provincial seal shows a conch shell on a Phan (tray) with glass decorations. The origin of the conch shell is unclear, but the most widely adopted interpretation is that it was a decoration on the jacket of the Prince of Songkhla. The provincial tree is the Sa-dao-thiam (Azadirachta excelsa). Songkhla is divided into 16 districts (amphoe), which are further subdivided into 127 subdistricts (tambon) and 987 villages (muban). The districts of Chana (Malay: Chenok), Thepa (Malay:Tiba) were detached from Mueang Pattani and transferred to Songkhla during the thesaphiban reforms around 1900. Songkhla Province is an energy hub. It earns 100 billion baht each year from a gas separation plant, power generation, and oil. The gas separation plant sells 35 billion baht worth of gas per year to EGAT. Power generation accounts for 45 billion baht. Offshore oil rigs in the vicinity of Ko Nu produce 20,000 barrels of oil per day worth 30 billion baht per year. If a proposed coal-fired electrical generation plan in Thepha District goes ahead, energy earnings could rise to 300 billion baht per year.